Comment It was on the third day of December in the year two thousand and eighteen that He arose and led the masses against the corruption and moral turpitude of the tech giants. For when He spoke, they heard. 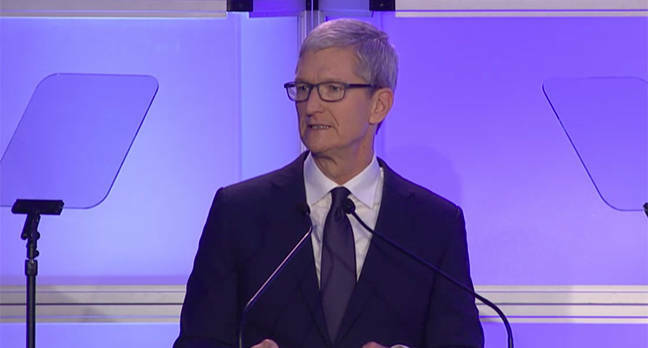 Yea, Tim Cook had come and cleansed us of our digital sins. "This year we've seen the stubborn and constant evils of anti-Semitism, violence and hate darken the streets of Pittsburgh and so many other places," sayeth the CEO of the world's largest company, named after the instrument of our original sin, the Apple. "Yet at the same time we've seen more and more people opening their eyes and rising to their feet and speaking out in defense of a society where we are all bound together by the values that we have in common." He noteth: "The most sacred thing that each of us is given is our judgment. Our morality. Our own innate desire to separate right from wrong." And they heard Him. "Choosing to set that responsibility aside at a moment of trial is a sin. We, as individuals, have the power to know and feel and act — and we ought to use it," He told the assembled masses at the Anti-Defamation League conference in New York – another Apple; the Biggest – while picking up an award celebrating himself. "I sometimes say that I worry less about computers that think like people and more about people that think like computers, without values or compassion, without concern for consequences," He spake. And as those assembled awakened as if from a great and deep slumber, he soothed their troubled souls. "We've only had one message for those who seek to push hate, division and violence," He said. "You have no place on our platforms. You have no home here." Our Cook has cast asunder the evil of Alex Jones with his hate-spreading Infowars app as well as… other people who have developed apps to spread their messages of hate, such as… Qdrops. Gab, maybe? But not NTA TV for it does not breaketh the rules. And silenced he has some others on iTunes for Apple controleth tightly the reins of its walled garden empire. And so He alone shall stop the spread of hatred. As well as the reach of business rivals and alternative revenue models. And for that, all He only asketh for is a 30 per cent cut. Removeth too your own music from your phone he has because He knows you want to pay his company for its streaming music service rather than play your own songs that you already bought elsewhere and went to trouble of saving onto His device. Except of course when His Excellency Bono the Third desire that you listen to his new album at which point he jammeth it on your computer whether you want it or not. "From the earliest days of iTunes to Apple Music today we have always prohibited music with a history of white supremacy," He spake. "Why? Because it’s the right thing to do. And as we showed this year, we won’t give a platform to violent conspiracy theorists. Why? Because it’s the right thing to do." And so it is the right thing to do. For all our shareholders. "Doing what's right," He reiterateth, "creating experiences free from violence and hate, experiences that empower creativity and new ideas - is what our customers want us to do." And those customers also want Apple to pressure news organizations to pay it to have their information on its platform; and to force companies to install its hardware and software in their products when they maketh a Smart Home (praise be!). "We believe the future should belong to those who view technology as a way to build a more inclusive and hopeful world," He noteth, forgetting to add "so long as they develop special versions for our operating systems and pay us handsomely for the privilege." He did not speak of security failings.